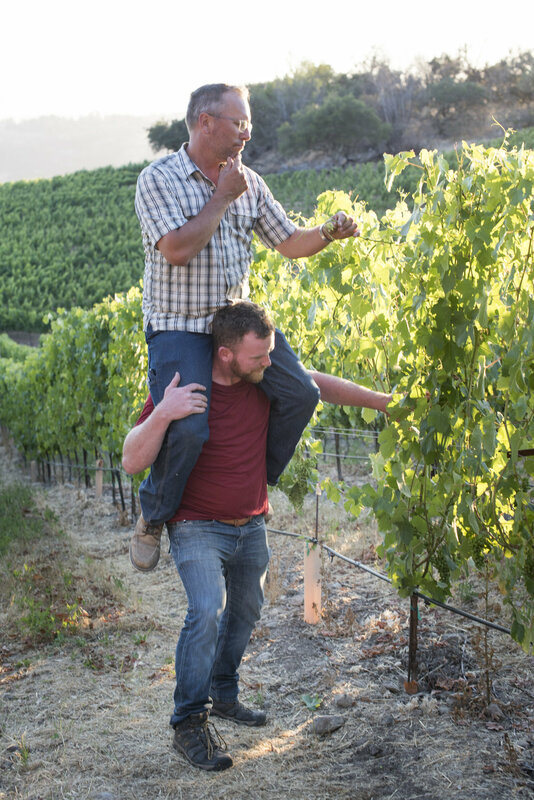 Winemaker Steven McCall lending a hand to vineyard manager Chris Bowland in the vineyard. Following the independent and energetic spirit within him and the desire to forge his own path in winemaking, Steven McCall established Sua Sponte Cellars in 2016. Although introduced to the Army Ranger motto “Sua Sponte”, which is Latin for, “Of their own accord”, while he served in 2nd Ranger Battalion he had already been living life of his own accord. On his own since the age of 17, Steven created his own unique journey to Sua Sponte Cellars. From barely graduating high school, to sleeping on a training table working for free as an athletic training intern to becoming an Army Ranger, his path is far from conventional. McCall, a Northern California local, didn’t take an interest in wine right off the bat. In fact, up until the age of 25 it was hard to see anything but a cold Bud Light in his hand. It took some convincing from a friend to get Steven to drink wine at all. While going to San Francisco State in 2011, Steven’s best friend asked him to help make a celebratory barrel of wine to commemorate the birth of his daughter. One barrel of fairly drinkable wine later, Steven was hooked to the craft. Steven took a year off school and went to work for Benovia Winery as a harvest intern under the direction of acclaimed winemaker, Mike Sullivan. Working amongst Fresno State alumni during his internship gave Steven the inspiration to enroll in the Enology program at Fresno State in Fall of 2013. Since completion of his degree, Steven has had the opportunity to work under highly esteemed winemakers such as: Jeff Mangahas of Williams Selyem and Anthony Beckman of Balletto Vineyards along with well-respected Sonoma County vineyard manager, Chris Bowland. Steven has truly embraced the “Sua Sponte” spirit and with the discipline he learned from his Ranger days, he looks at Sua Sponte Cellars to craft wines he loves, of his own accord. Steven now sources grapes from the best vineyards in the North Coast and strives to make great wines from popular varietals such as Pinot Noir and Chardonnay as well as other varietals that he is very passionate about such as: Nebbiolo and Nero D’Avola.